As a member of the Moroccan Wrestling team in the 1996 Olympic Summer games, Aziz Khalfi has come to America to share his fitness training expertise and techniques with the competitive athlete and fitness enthusiast. 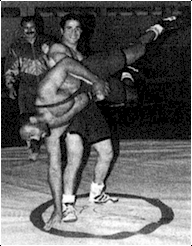 Aziz won his first national competition in 1991 in the Junior Division of his national wrestling team. After advancing to the Senior Division, he continued to win national titles and gain recognition in the wrestling community. He continued to excel and distinguish himself as he entered international tournaments. Aziz is also a competitive football (soccer) player, having competed in the 1986 World Cup in France. But his love is unquestionably wrestling! In 1995, he was honored by being selected from the top wrestlers in Morocco to compete and represent his country in the 1996 Olympic Summer Games in Atlanta. A well deserved honor, indeed! Now, don't let his resume intimidate you! Aziz is very user friendly. He is uniquely skilled and well versed in designing basic to advanced weight training and body sculpting programs. This includes cross training activities that strengthen and diversify prescribed fitness routines. Aziz is also CPR (Cardiopulmonary Resuscitation) and AFA (Aerobic and Fitness Association of American) certified.